Above the Napa Valley is the esteemed and beautiful Howell Mountain – a Napa Valley viniculture region that is known for producing exquisite wine grapes. George and Nancy Bravante were well aware of this fact in the 1990s when they founded and opened Bravante Vineyards in the Howell Mountain sub appellation. The combination of vineyards at high elevation and the sympathetic Napa Valley soil make the two on site vineyards, Black Oak and Stone Ridge, some of the regions finest. A Bravante Vineyards Wine Tasting Tour will bring you up into the Howell Mountain region and give you an up close and personal taste of the wines everyone is raving about. Initially beginning by planting Bourdeaux Varietals and Sauvignon Blanc, Bravante Vineyards produces Sauvignon Blanc and Sauvingon Musque blends, Merlot as well as its most popular wines Cabernet Sauvignon and Simpatico. The range of wines you will taste on your Bravante Vineyards Wine Tasting Tour will run the gambit of the wine world yet be focused enough to really expose the wines that Bravante Vineyards does best. 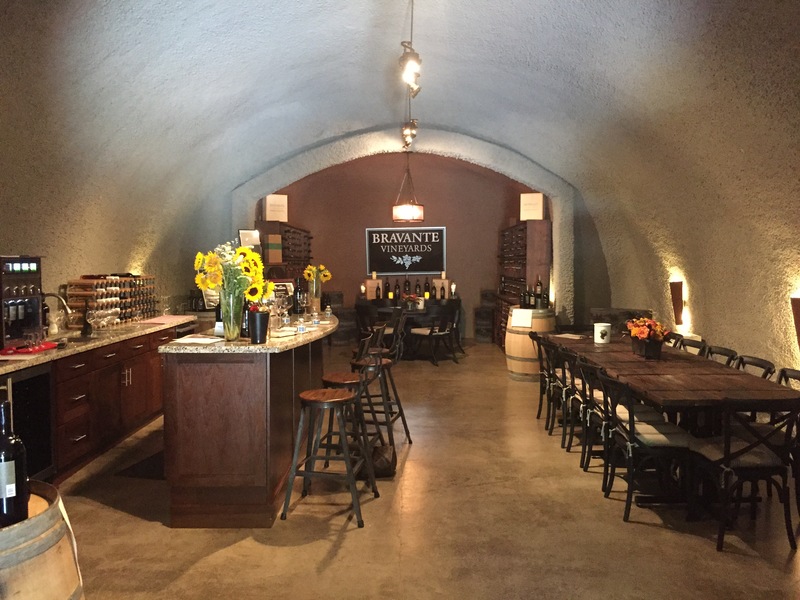 With a focus on the wines it does best and a production rate between 2500 and 3000 cases, Bravante Vineyards combines the best of what larger wineries have to offer with the simplicity and size of a small vineyard. On your Bravante wine tasting tour you will taste exactly what the Napa Valley is all about. Without a doubt the finest way to enjoy what the Napa Valley has to offer is with a Limousine Wine Tour to the Bravante Vineyards. Our professional and personable staff are easy to work with and are able to accommodate your specifications and requests without problems. On your Limousine Wine Tour to Bravante Vineyards we will agree upon a meeting time and place and your journey will be ready to go. An Apex Limousine Wine Tour to Bravante Vineyards is available for groups of all sizes and our vehicles can accommodate accordingly. Each Apex limousine wine tour to Bravante Vineyards includes riding with a professional and experienced limousine driver that will bring you directly to the wonderful wines of the Bravante Vineyards with ease as well as the utmost safety. We believe in working with drivers who have comprehensive experience as well as safe driving records. This allows us to always provide our clients with unmatched professionalism as well as luxurious conditions. A limo wine tour to Bravante Vineyards allows you to enjoy the surroundings of the Napa Valley as well as taste Napa Valley wines unlike you ever have before. Whether you are a wine country veteran or are planning your first limousine wine tour to Bravante Vineyards – Apex is here to provide unparalleled customer service and transportation services every step of the way. Give us a call to book your journey today and let the fun begin. Here at Apex limos we specialize in providing wine tours and transportation to our clients. We are available to bring you and your party to Sonoma, Livermore or the Napa Valley and experience the unique wine culture of each Northern California destination. Without a doubt we believe wine tours are the perfect way to explore any given wine country – a limousine combined with an itinerary of wineries and restaurants allows you to experience everything that Sonoma, Livermore or Napa Valley have to offer. Whether you are going on your 50th or 1st wine tour with Apex, every time can be unique and special experience as the first wine tour you went on. We are more than happy to customize your wine tour so that you can taste the wineries and restaurants that match your tastes and specific desires. From the moment you call us, our friendly customer service representative will use your detailed request and provide the service that most appropriately matches. Our new model limousines are driven by professional drivers who each have years of experience, knowledge of the Northern California wine countries and of course clean safety records. We believe in providing you with not only transportation to the wine country but in providing comprehensive, safe and fantastic luxury transportation so you can relax, kick back and enjoy your day. Our goal is to make your wine tour and transportation an unforgettable experience every step of the way. Here at Apex we are able to help turn any day of the week into a special event that you will always remember. Our limo wine tours transportation combine the perfect amount of luxury with fantastic customer service to make booking a wine tour or transportation easier than ever. We know how difficult it can be to find exactly the type of wine tour you are looking for. With Apex, we have years of experience navigating the wine countries of Northern California and are now more than ever capable of pointing you in the direction of the restaurants and wineries that make Sonoma, Livermore and Napa as special as they are. We focus on bringing you to the wine country in style, luxury and relaxation every step of the way.